Fall is Here – It’s Time for a Termite Checkup! - Yes Pest Pros, Inc. Fall is Here – It’s Time for a Termite Checkup! - Yes Pest Pros, Inc.
Fall is Here – It’s Time for a Termite Checkup! When fall arrives, it’s a good time to call an Indiana termite pest control company to do a thorough check of your home for termites. Having someone perform this check once per year is an excellent idea because it gives you to tackle the problem before it gets out of hand, as well as protect against it in the future. If you can keep termites away, then your home will stand strong for years to come – as well as save you a lot of money in repairs! What Makes Fall So Special? Termites swarm in the fall and in the spring, which means if you’ve seen a lot of insects rising up from the ground and flying away, then they’re either termites or ants. If they’re close to your home, you should contact an Indiana pest and termite control company like Young Environmental Solutions to make sure that they are not actually in your home and doing damage. Even if you never see a termite swarm, the simple fact that fall is when they do swarm can mean one or more end up at your home and begin to create a colony there. Swarming termites are termites that are leaving their current colony in order to start another somewhere else. You should have an inspection done to make sure none have arrived and begun to create a new colony. There are some simple steps you can take to help prevent termite problems. These steps make it less likely that a termite will find your home appealing for a colony. This includes removing any wood that is touching the soil or wood that is set near your house where termites might want to live, such as lumber piles, old stumps, or dead trees. Make sure moisture flows away from your home. Termites prefer a location that has moisture, so if you have standing puddles near your home or other locations where water can accumulate, fix the problem so water can drain properly. If you suspect termites are already in your home, you can do a few checks yourself, such as looking under the structure of your home if possible to see if there is evidence of mud tunnels, if areas of wood are darkened or look as though they are blistering, or if you prod at areas of wood and they feel soft or give way entirely. 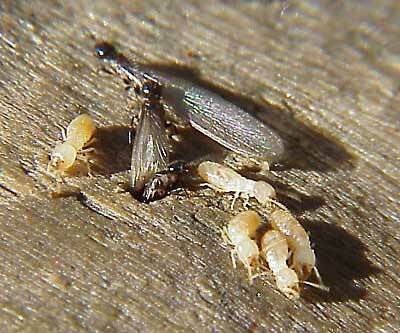 Termites can do a great deal of damage if left unchecked, so call an Elkhart pest control company immediately. They can help you with the right kind of protection to keep termites safely away from your home.